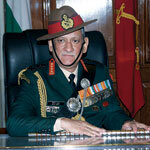 General Bipin Rawat took over as the new Chief of the Army Staff on January 1, 2017. 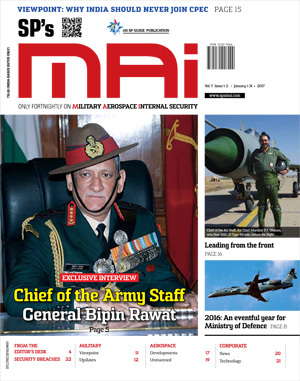 In an interview with SP’s M.A.I., he gave his candid views on a wide range of subjects and the major challenges confronting the Indian Army and how these are being tackled institutionally. Khanderi, the second of Indian Navy’s Scorpene class stealth submarine, was launched recently by the Minister of State for Defence Dr Subhash Bhamre paving the way for her sea trials. A three-member delegation led by Director General of Sri Lanka Coast Guard Rear Admiral Samantha Wimalathunge, was on a three-day visit to India from January 3, 2017, for a high level meeting, with the Indian Coast Guard. Air Marshal S.B. Deo has taken over as Vice Chief of the Air Staff (VCAS) at Air HQ. 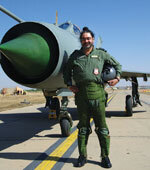 He was commissioned as a fighter pilot in the IAF on June 15, 1979. 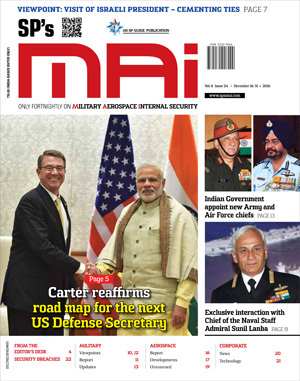 He is an alumnus of the National Defence Academy and the Defence Services Staff College, Wellington. Air Marshal C Harikumar took over as AOC-in-C, Western Air Command (WAC), on January 1, 2017. Air Marshal Harikumar was commissioned in the IAF in the year 1979. A Qualified Flying Instructor and a Fighter Combat Leader, he has over 3,300 hours of flying. Air Marshal Anil Khosla took over as Air Officer Commanding-in-Chief of Eastern Air Command on January 1, 2017. 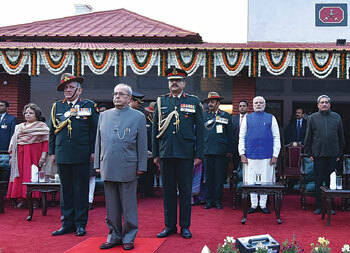 Air Marshal Khosla, an alumni of the National Defence Academy, was commissioned in the fighter stream of IAF in December 1979. Air Marshal Sanjay Sharma assumed the responsibilities of Air Officer-in-Charge Maintenance at Air Headquarters, New Delhi, on January 1, 2017. The Hawk advanced jet trainer (AJT) has clocked 1,00,000 hours of flying hours with the Indian Air Force (IAF). BAE Systems, the makers of Hawk Mk132 AJT, termed the achievement as an “important milestone” and a compelling story of success. Textron AirLand LLC announced the successful maiden flight of the first production-conforming Scorpion jet. This programme milestone closely follows the recent successful weapons capability exercise on the prototype Scorpion completed in early October. The French Direction Générale pour l’Armement (DGA) ordered a fourth MALE (medium altitude, long endurance) Reaper unmanned aircraft system. The Israeli Air Force (IAF) UAV squadron that operates the Kochav (Hermes 900) UAV will multiply the number of Hermes 900 UAVs that it operates by six during the coming year. 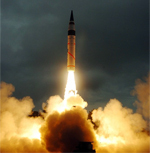 The Defence and Research Development Organisation (DRDO) successfully flight tested the Smart Anti-Airfield Weapon (SAAW), from an Indian Air Force (IAF) aircraft. On December 20, the two-time Wimbledon champion Petra Kvitova said she is “fortunate to be alive” after being injured in a potentially career-threatening knife attack at her home. 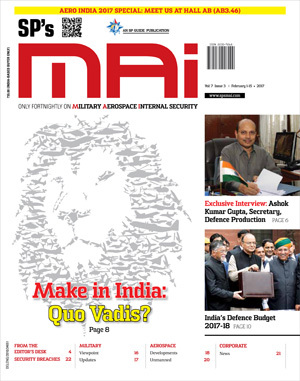 Defence Minister Manohar Parrikar visited Defence Research and Development Organisation’s (DRDO) Dr A.P.J. Abdul Kalam Missile Complex during his visit to Hyderabad on January 16, 2017. 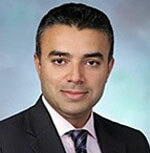 BAE Systems has announced the appointment of Nik Khanna as the Managing Director of its India operations with effect from February 1, 2017. Nik joins the company from Raytheon where as Country President he led business development, marketing and strategy in India for the last four years.